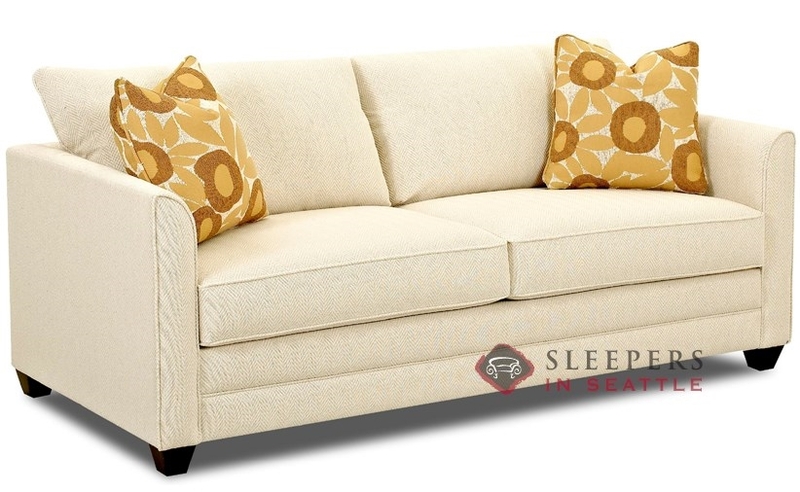 Chic and nimble, the Valencia Queen Sleeper is a fit for any home. 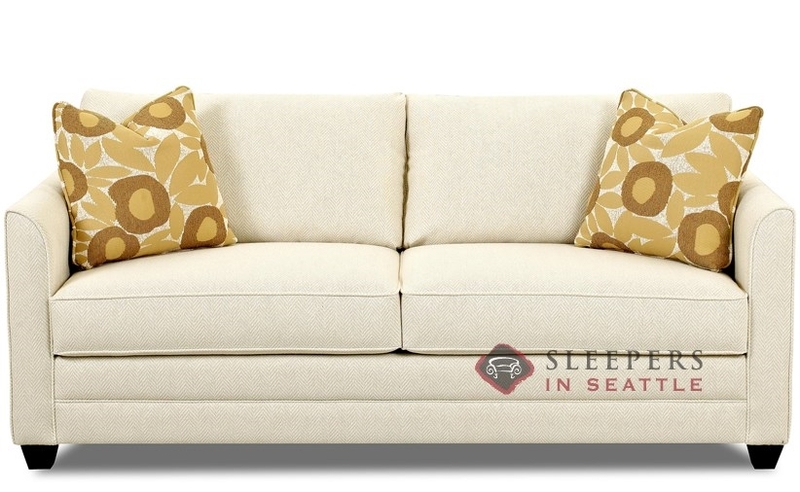 Thin, sloped arms, and welted detail give this sofa bed a unique look. The Valencia vies with the San Francisco Queen for the distinction "most compact Classic Sleeper." I ordered this in Mystic Bluebird! I can’t post a photo here but the actual size and color of the pattern is radically different than shown online. It is actually large circles, not small, and they are navyish not blue green. I do like the pattern it has grown on me but the online images should be updated. Was expecting my parents to come visit, (and I wanted a new couch anyways) so I got this sleeper. Slept on it myself a couple nights before they came to make sure it was okay, and exceeded my expectations… by a lot. Didn’t think something pushed inside a couch would be that comfortable to sleep on. My parents had no problem with it either. It’s also functioned very well as an everyday sofa. Perfect fit in our space. But, they didn't have it in stock in the color I wanted so I had to wait a month for it to arrive...overall, happy with the purchase. What is the overall length, end to end, once the bed is extended. Your site has the mattress length but I couldn't find "overall length" Thanks. 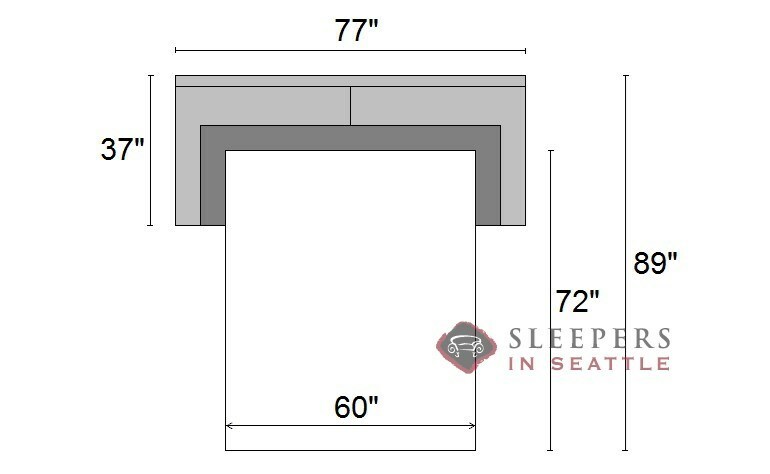 The overall footprint of this sleeper, when opened, is approximately 89". What is the frame of the couch made of? Thanks! The frame of the Valencia Queen Sleeper is made from kiln-dried hardwood, and is covered by a lifetime warranty. Are the cushion covers removable for cleaning/washing? Yes, absolutely; the cushion covers can be removed for cleaning and washing. Do the feet come off (for ease of fitting in house)? And what is the fabric selection shown in the picture online ? Yes, the feet easily unscrew to facilitate delivery. In fact, the compact Valencia is one of our easiest products to deliver! 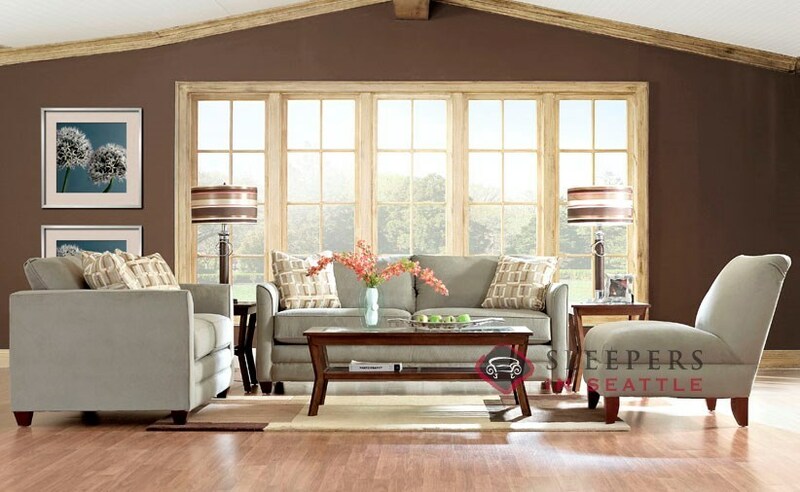 In the picture above, the Valencia is shown in a discontinued upholstery--however two VERY similar options, which are currently available, are SOLO NATURAL and BULL NATURAL. Are the back pillows attached to the back of the couch? Yes, indeed, the back cushions of the Valencia model are attached--sewn to the top of the 'hard-back'. 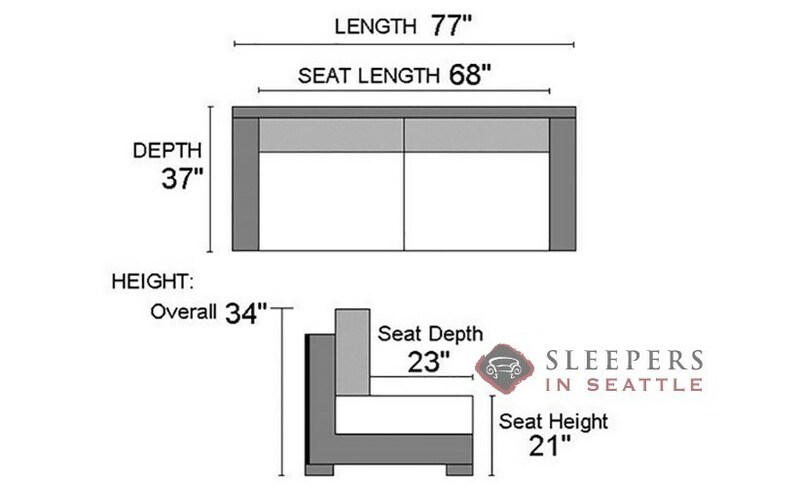 what is the arm height on the Valencia sleeper sofa? The height of the Valencia arm, from the floor to the top of the arm, is 27 inches. The height from the top of the seat cushion to the top of the arm is 9 inches. what is the minimum door size for ease of delivery? Thanks! The minimum door width would need to be 27" or greater. I love the look of the armless chair in the photo that is paired with the Valencia sleeper. Is this available to purchase? I don't see this chair by Savvy. Is this a style chair from another company and can it be ordered from your site as well or do you only do sleepers? Absolutely, the chair shown in the photo is available for purchase. While it's not currently displayed on our website, simply get in touch with our sales team and we'll be happy to help out. How much does this sofa weigh? The Valencia Queen weighs about 180 lbs. How deep is the seat on this sofa? The seat on the Valencia is about 22" deep. What color is the Valencia couch on the display page? i am having a hard time finding that color in the swatches. The fabric shown on our site has been discontinued, but we have two replacements that are very similar, including Brookside Ecru and Enello Rice. What do the fabric codes stand for? I see "W" and "S" codes. I'm looking for machine washable fabrics. Thanks! The W stands for water-based cleaners, and avoid solvent-based cleaners. The S stands for solvent-based cleaners, so avoid water-based products on these. What kind of mattress is it? Coil? Memory foam? And how thick? There are actually three mattress options for this style, including the included 6.5" thick Dreamsleeper, an Air-Dream, and a Gel-Infused Memory Foam. You can select your favorite after clicking on the START CUSTOMIZING button above, and then clicking on UPGRADES. What flame retardants are in this sofa? None! Our Savvy brand furniture is entirely free of chemical flame retardants. how comfortable is the sofa to sit on. only my company would sleep on the sofa bed & I would be sitting on the sofa. my past experience when sitting on a sofa bed is the bottom cushions are not that supportive. The Valencia includes a lifetime warranty on the frame, and was originally designed as a stationary sofa--so comfort as a couch is certainly provided. The support and comfort is not at all hindered by the sleeper inside. The bed was originally included for convenience. Now, with the improvements made to the mechanism (the bar has been moved) and the improved mattresses, this Valencia Sleeper truly provide a great night's sleep as well. I'm interested in learning more about the mattress options. Thanks! You can see the mattress options for this sleeper by clicking on the Mattress Options icon just above, or by clicking the START CUSTOMIZING button, and going to the Upgrades tab! What is the weight limit for the bed? The weight limit for the Valencia bed is about 500lbs. How much more comfortable is the standard (free) mattress vs. the most expensive Enso gel-infused mattress? 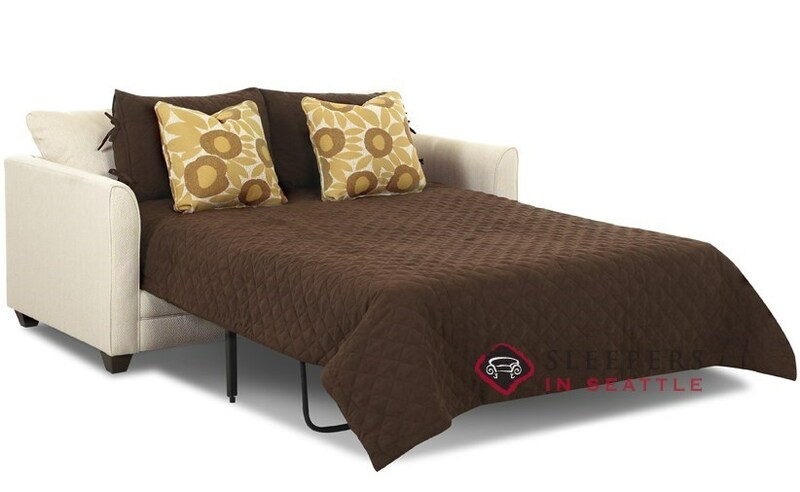 The included mattress is absolutely a step up from the industry average--as is the mechanism on this piece, with the bar moved away from the small of your back. While 'how much more' is a subjective question which is tough to answer, the Gel-Infused Memory Foam Mattress is exceptionally comfortable, supportive and durable. Can this fit in a 31 inch wide doorway? Absolutely! The Valencia can fit through a 31" doorway with no problem at all. 72" is 8" shorter than a true queen. Can a 6' tall person sleep on this bed? Where can sheets be purchased? While it depends on how an individual sleeps, generally someone 6' tall can sleep on the Valencia. Most people do compress their body a bit to sleep, which does allow ample space. We do offer custom sheets too, designed specially for these mattresses. You can purchase them in your cart while checking out or by phone with a team member.